On Saturday, I received a one-line email from my father: Morrie Turner passed away today. When a person reaches 90, you know they’ve only got so much time left. Still, the news sent a little shockwave through my chest. Morrie had always been a fixture in my life. 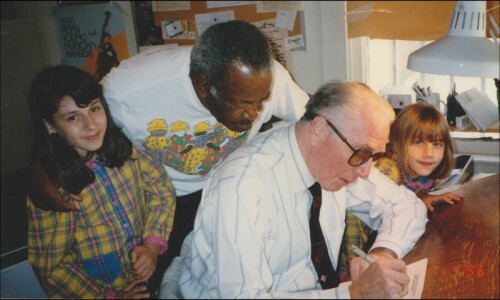 His Wee Pals comics graced the walls of my childhood home, and I kept a single framed picture on my desk: a photo of me, my younger sister, my grandfather, and Morrie—all gathered around an unfinished Wee Pals comic strip. Me on the far left, with Morrie, my grandfather, and my sister. At first, newspapers were hesitant to pick up Wee Pals. An “integrated” comic? It was just too…radical. It wasn’t until 1968, after the assassination of Martin Luther King, that the strip achieved national syndication. In the late 60s, my grandfather—Sid Shaffer—read an article about Morrie’s up-and-coming cartoon in a local paper. As a gregarious young insurance broker, Sid was always on the lookout for new clients, so he sat down to write Morrie a letter. I’ve heard the story many times, both from my grandfather and Morrie. The letter began with a friendly (perhaps overly forward) introduction. My grandfather wrote that, though they came from different backgrounds, they had quite a bit in common. They were both at the start of their careers, both raising families, and they shared a lifelong love of cartoons. It took many years, and many letters, before my grandfather succeeded in selling Morrie an insurance policy. But by that time, they’d already become good friends. In fact, the thing that caught Morrie’s eye in their frequent communications was my grandfather’s impeccable penmanship. Eventually, Morrie asked Sid if he’d like to do the lettering for Wee Pals. Sid gleefully agreed, and a partnership was formed. 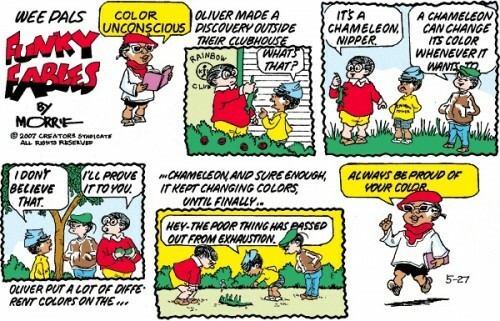 A 1996 Wee Pals comic, inspired by my childhood environmentalism. According to both of them, there was never any bickering, no debates about creative control. When I visited last March, they were still mailing weekly comic strips back and forth. At that point, they’d been working together just shy of 50 years. That was always the goal—making it to the 50 year mark. But, the closer it got to that point, the harder it was to keep going. I don’t think either of them wanted to admit that. Wee Pals wasn’t just a hobby; it was the foundation of a friendship, the symbol of a movement, and a reminder that despite their age, they were still creating something new. At one point during my Oakland visit, I heard my grandfather curse from the kitchen. I ran to the kitchen. He always worked on Morrie’s comics at the kitchen table—with a tall glass of Metamucil orange juice, an artist’s pencil, and a kneaded eraser by his side. During this ritual, he’d give his complete attention to the current batch of Wee Pals strips. If he took a break, it was only to phone Morrie—to ask for clarity about a joke, a gesture, or the placement of a sentence. I had startled him, and it took him a moment to regain composure. I looked down at the comic, and saw the signs of age right there on the page. The linework was loose, as if the characters were unraveling at the seams. The joke was sweet, but it was clearly the joke of an aging grandfather. The kind of joke that made you smile and say, “That’s nice, grandpa,” because it might have been funny the first time, but you’d heard it ten times before. And then there was my grandfather, riddled with Parkinson’s, cursing his shaking hands as he struggled to draw a straight line. I wondered if they’d really make it to the 50 year mark. A part of me hoped so, but then, everything has its golden age. I thought about Wee Pals now and the Wee Pals of yesterday. I thought about the newspapers that had already dropped the comic from syndication—and I thought about the papers that didn’t have the heart to tell two wonderful, sweet old men that the time to retire had already passed. Whenever my grandfather called Morrie, he began with the question, “How ya doing, kiddo?” I’ll miss that. And I’ll miss Wee Pals, too. I hope the Wee Pals you remember is funny, poignant, and groundbreaking. That’s the one I remember, and it will stay with me for the rest of my life. Edit: My grandfather, Sidney Shaffer, passed away on June 14, 2014, less than six months after this piece was written. He is missed. I was Morrie’s next-door neighbor in Berkeley from 1997 to about 2010 when he stopped coming down from Sacramento and we moved away (partly because it felt a little less like home without him). Your father would always greet me when he visited Morrie, and never failed to ask after my father (he says he played ping-pong with my father many years ago, which is unlikely but not impossible). I enjoyed watching Morrie and Sid (I always called him Mr. Shaffer) trot out the old jokes and banter for my benefit. Morrie told me he hoped to never have to retire, to never talk about cartooning as something he “used to do”. I’m glad he got that wish.